South entrance to Little Tokyo/Arts District Station remains closed for future Regional Connector construction work. 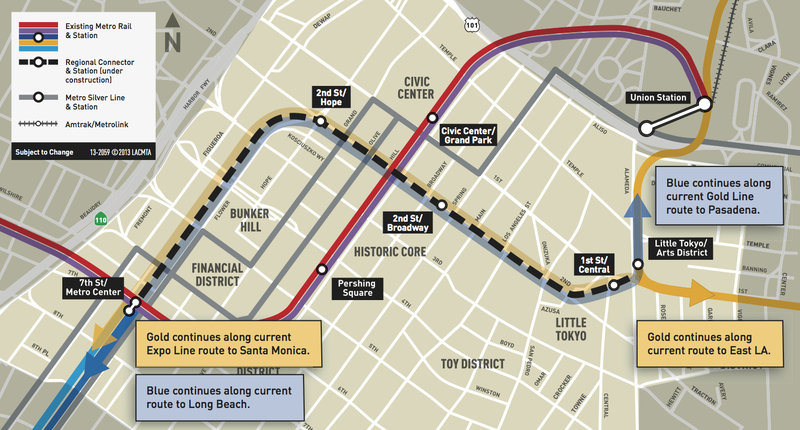 The three-month Little Tokyo/Arts District Station closure is set to begin Friday night, January 8, for major track relocation and tunneling work for the Regional Connector project. The Gold Line tracks are being moved from middle of 1st Street to the north side of the street in order to build the new tunnel entrance in the middle of 1st Street. Union Station at Patsaouras Plaza Bus Bay 7 (drop off at Bay 9). Little Tokyo/Arts District at Judge John Aiso/1st. The trip between Union Station and Pico/Aliso Station is expected to take about 15 minutes. There will be Metro staff on hand to help customers navigate the shuttle in addition to signage at all stations. An alternative option is Metro Local Bus 30, which runs between the Gold Line’s Indiana Station in Boyle Heights and downtown Los Angeles (and continues west to Mid-City and Beverly Hills). Gold Line service will operate between Pico/Aliso Station and Atlantic Station in East L.A. every 10 minutes during peak hours. Service between Union Station and Sierra Madre Villa in Pasadena will continue to run its regular schedule. Metro and the project contractor are also planning weekend closures of the 1st Street and Alameda intersection to facilitate construction. The closures are scheduled for Friday, January 8 at 9 p.m. through Monday January 11 at 4 a.m. Subsequent weekend closure are scheduled for February 12 through February 15, February 19 through February 22 and February 26 through February 29. Thru traffic will be maintained on Alameda Street between Temple Street and 2nd Street with one lane open in each direction. Westbound 1st Street will be closed between Alameda Street and Vignes Street 24-hours a day from January 8, 2016 through March 2016. One thru lane on eastbound 1st Street will be maintained between Alameda Street and Vignes Street. Full closure of 1st Street between Central Avenue and Alameda Street will also take place intermittently. Westbound 1st Street traffic will be detoured right on Vignes Street, left on Temple Street, left on Judge Aiso Street, back to 1st Street. Eastbound 1st Street traffic will be detoured left on Judge Aiso Street, right on Temple Street, right on Vignes Street back to 1st Street. No thru traffic on Alameda between Temple and 2nd street. First Street will be closed to all but local traffic. Metro will provide a free Little Tokyo/Arts District Shuttle to circulate through the shopping district during the closure and a Little Tokyo Validation Parking Program at three area parking lots: Mangrove Parking Lot at 428 E. Temple Street; St. Francis Xavier Catholic Church Parking Lot, 222 South Hewitt Street, enter on 3rd Street, and; the Sho Tokyo Parking Lot/Joe’s Parking Lot, 350 E. 2nd Street. To receive parking validation from a Little Tokyo business, ask for a “Metro Validation” and present it to the parking attendant when ready to depart. For more, here’s the full press release from Metro, and here’s the construction notice. The Regional Connector is a 1.9-mile underground light rail line that will connect the Blue, Expo and Gold Lines in downtown Los Angeles. The project includes three new stations at 1st/Central, 2nd/Broadway and 2nd/Hope. The project will allow more one-seat rides to and through downtown L.A. and save many riders from the need to transfer to reach their destinations. 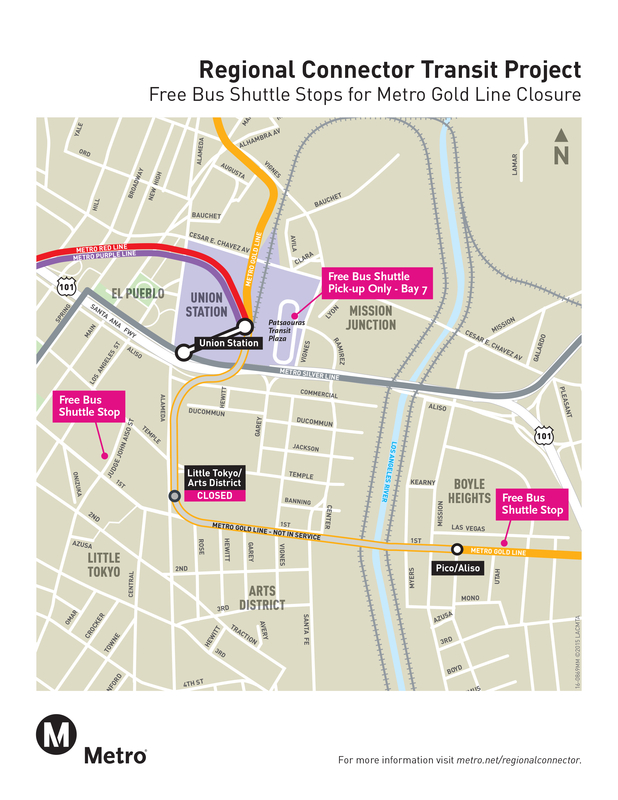 Since Gold Line trains north of Union Station will NOT be originating from the Atlantic Station, will this closure in any way impact the start date and/or schedule of passenger services of the new Foothill Gold Line?. If the tracks are being moved and service disrupted how are the trains going to be serviced and stored on the East L.A. leg? Seems like they could have put the shuttle stop closer to the middle of Little Tokyo. Oh well, as long as I can get to Nijiya or Anime Jungle. Rather than “move” the existing tracks, Metro should have laid new temporary tracks. This would have avoided the big hassle and DELAY of using the shuttle bus option and maintained the current 6 minutes headway during rush hour, instead of increasing it to 10 minutes, on the eastside. As a frequent rider of Goldline east, the meandering 15 minute bus shuttle trip is nearly as long as the time it currently takes to get from Union Station to my eastside stop on Goldline today. MTA was NOT considering the inconvenience to its riders. Where was the Administer of Extraordinary Innovation as this stupid idea approached reality. Not too late to put the riders first IF the Office of EI really wants to be “innovative” and say MTA needs to put the riders FIRST instead of the other way around. The tracks are being moved temporarily to the north side of the street and then will be moved back to the center of the street, where the portal will be.